The Lake Monroe Sailing Association (LMSA) is a member run, non-profit enterprise that operates the Moores Creek Sailing Marina at Lake Monroe under a paid lease from the Indiana Department of Natural Resources. The marina is available specifically to the sailing public and offers low fees for boat storage and facility use. LMSA is managed by an elected board of directors. Membership in LMSA, which is separate from usage fees, allows participation in a series of social and racing events, as well as voting privileges. LMSA promotes and encourages the sport of sailing, seamanship, and water safety through instructional programs for ages 9 and up, with courses taught by instructors certified by US Sailing and the American Sailing Association. For adults who are completely new to sailing, there are great opportunities to get to know the sport, either by taking a small boat course (under 20 feet) or a keelboat course. Once a person passes the US Sailing Small Boat Course and passes a certification test (provided on site), they are eligible to use LMSA fleet boats to practice sailing (a small day use fee applies). Not ready for a course? Experience a leisurely sail on a keelboat with an experienced skipper! LMSA Family Sails are a great way to try something new, learn a little bit about sailing and experience an activity that provides a whole new perspective on Lake Monroe. Family sails are available for 2-4 participants. Give it a try- sailing is a thrill and easier than it might seem to be! Learn more about adult sailing lessons or contact the LMSA Facility Manager for more information. The LMSA Youth Sailing Camp offers summer sailing lessons for children in cooperation with the city of Bloomington Parks & Recreation Department. Sailing Camp teaches kids how to be safe on the water and how to be confident and competent sailors. Many of our Camp Kids have “graduated” from camp to become interns and certified instructors. Camps last a week, Monday – Friday (9 am to 3 pm), from May through August. The roster of participants fills up fast, so we suggest reserving spots for your kids early through the city of Bloomington Parks and Rec Department website. Repeat campers are welcome, too- some kids attend two or three weeks each year. The marina offers 100 wet slips, some of which can accommodate boats up to 34′, and anchored buoys, with dinghies available 24/7 for the convenience of owners moored in the buoy field. There is currently no waiting list for slips and buoys. LMSA also offers dry storage for boats in a secure area on shore, convenient to the LMSA high water launch ramp which can also be used for small boats. The summer sailing season is from about April 1 until November 1 each year. There is also dry storage for boats on trailers during the winter months. A facility manager is on the premises all year to maintain security. For information about obtaining a slip or buoy, please contact the LMSA Facility Manager or visit the LMSA Shop. 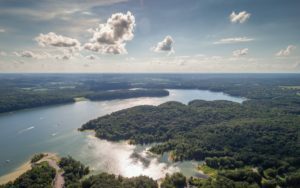 Lake Monroe, located just south of Bloomington in the rolling, wooded hills of Southern Indiana, is one hour south of Indianapolis, two hours west of Cincinnati, and two hours north of Louisville. The sailing marina is adjacent to a large public access launching ramp at Moores Creek on Lake Monroe. LMSA’s facilities include four shelter houses overlooking the lake, a toilet and shower house, camping areas, parking areas, a children’s playground, ice machines, courtesy docks, a gin pole for stepping masts, hoists for launching small boats, and a small-boat ramp. Drinking water and a pump out service is available near the docks. To arrange for a tour of the marina facility, or to request additional information, contact the LMSA Facility Manager.